Svider PF, Darlin S, Bobian Met al. Evolving trends in sinus surgery: What is the impact of balloon sinus dilation? Laryngoscope 2018; 128:1299-1303. Strazdins E, Nie YF, Ramli Ret al. Association Between Mental Health Status and Patient Satisfaction With the Functional Outcomes of Rhinoplasty. JAMA Facial Plast Surg 2018. Strazdins E, Harvey RJ. Mental Health and Nasal Function-Reply. JAMA Facial Plast Surg 2018; 20:87. Orgain CA, Harvey RJ. The role of frontal sinus drillouts in nasal polyposis. Current opinion in otolaryngology & head and neck surgery 2018; 26:34-40. Oakley GM, Christensen JM, Winder Met al. Collagen matrix as an inlay in endoscopic skull base reconstruction. The Journal of laryngology and otology 2018; 132:214-223. Oakley GM, Christensen JM, Sacks R, Earls P, Harvey RJ. Characteristics of macrolide responders in persistent post-surgical rhinosinusitis. Rhinology 2018. Ho J, Hamizan AW, Alvarado R, Rimmer J, Sewell WA, Harvey RJ. Systemic Predictors of Eosinophilic Chronic Rhinosinusitis. Am J Rhinol Allergy 2018:1945892418779451. Harvey RJ, Snidvongs K, Kalish LH, Oakley GM, Sacks R. Corticosteroid nasal irrigations are more effective than simple sprays in a randomized double-blinded placebo-controlled trial for chronic rhinosinusitis after sinus surgery. Int Forum Allergy Rhinol 2018; 8:461-470. Hamizan AW, Loftus PA, Alvarado Ret al. Allergic phenotype of chronic rhinosinusitis based on radiologic pattern of disease. Laryngoscope 2018. Strazdins E, Nie YF, Ramli Ret al. Association of Mental Health Status With Perception of Nasal Function. JAMA Facial Plast Surg 2017; 19:369-377. Strazdins E, Nie Y, Ramli Ret al. The Impact of Mental Wellbeing on Functional Outcomes of Rhinoplasty. JAMA Facial Plast Surg 2017:in press. Sivasubramaniam R, Harvey RJ. How to Assess, Control, and Manage Uncontrolled CRS/Nasal Polyp Patients. Current allergy and asthma reports 2017; 17:58. Rom DI, Christensen JM, Alvarado R, Sacks R, Harvey RJ. The impact of bitter taste receptor genetics on culturable bacteria in chronic rhinosinusitis. Rhinology 2017; 55:90-94. Parthasarathi K, Christensen JM, Alvarado R, Barham HP, Sacks R, Harvey RJ. Airflow and symptom outcomes between allergic and non-allergic rhinitis patients from turbinoplasty. Rhinology 2017; 55:332-338. Oakley GM, Harvey RJ, Lund VJ. The Role of Macrolides in Chronic Rhinosinusitis (CRSsNP and CRSwNP). Current allergy and asthma reports 2017; 17:30. Oakley GM, Harvey RJ. Endoscopic Resection of Pterygopalatine Fossa and Infratemporal Fossa Malignancies. Otolaryngol Clin North Am 2017; 50:301-313. Oakley GM, Ebenezer J, Hamizan Aet al. Finding the Petroclival Carotid Artery: The Vidian–Eustachian Junction as a Reliable Landmark. J Neurol Surg B 2017. Leason SR, Barham HP, Oakley Get al. Association of gastro-oesophageal reflux and chronic rhinosinusitis: systematic review and meta-analysis. Rhinology 2017; 55:3-16. Knisely A, Holmes T, Barham H, Sacks R, Harvey R. Isolated sphenoid sinus opacification: A systematic review. Am J Otolaryngol 2017; 38:237-243. Harvey RJ, Nalavenkata S, Sacks Ret al. Survival outcomes for stage-matched endoscopic and open resection of olfactory neuroblastoma. Head Neck 2017; 39:2425-2432. Hamizan AW, Rimmer J, Alvarado Ret al. Positive allergen reaction in allergic and nonallergic rhinitis: a systematic review. Int Forum Allergy Rhinol 2017; 7:868-877. Hamizan AW, Christensen JM, Ebenezer Jet al. Response to: Defining a diagnostic marker: a pragmatic requirement. Int Forum Allergy Rhinol 2017; 7:634-635. Eloy JA, Svider PF, Bobian Met al. Industry relationships are associated with performing a greater number of sinus balloon dilation procedures. Int Forum Allergy Rhinol 2017; 7:878-883. Ebenezer JA, Christensen JM, Oliver BGet al. Periostin as a marker of mucosal remodelling in chronic rhinosinusitis. Rhinology 2017; 55:234-241. DelGaudio JM, Loftus PA, Hamizan AW, Harvey RJ, Wise SK. Central compartment atopic disease. Am J Rhinol Allergy 2017; 31:228-234. Christensen JM, Cheng J, Earls Pet al. Vitamin D pathway regulatory genes encoding 1alpha-hydroxylase and 24-hydroxylase are dysregulated in sinonasal tissue during chronic rhinosinusitis. Int Forum Allergy Rhinol 2017; 7:169-176. Barham HP, Zhang AS, Christensen JM, Sacks R, Harvey RJ. Acute radiology rarely confirms sinus disease in suspected recurrent acute rhinosinusitis. Int Forum Allergy Rhinol 2017; 7:726-733. Ahmadi N, Christensen JM, Barham HP, Oakley GM, Sacks R, Harvey RJ. Allergic sensitization does not predispose to sinus inflammation in externalized paranasal sinuses. Am J Rhinol Allergy 2017; 31:3-6. Nalavenkata SB, Sacks R, Adappa NDet al. Olfactory Neuroblastoma: Fate of the Neck–A Long-term Multicenter Retrospective Study. Otolaryngol Head Neck Surg 2016; 154:383-389. Barham HP, Ramakrishnan VR, Knisely Aet al. Frontal sinus surgery and sinus distribution of nasal irrigation. Int Forum Allergy Rhinol 2016; 6:238-242. 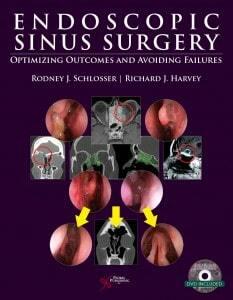 Knisely A, Harvey R, Sacks R. Long-term outcomes in endoscopic dacryocystorhinostomy. Current opinion in otolaryngology & head and neck surgery 2015; 23:53-58.